At the end of July 1987 the Italians had arranged a large technical conference on digital cellular radio in Venice. I agreed with Armin Silberhorn, Philippe Dupuis and Renzo Failli to take advantage of the event to draw up the proposed commercial operators’ agreement that I named “a Memorandum of Understanding”. We all agreed that we should extend the co-operation at this critical stage to include Sweden. Through them there was a good chance of bringing in the Scandinavian countries. Renzo Failli had arranged for us to meet in the head office of the local telephone company SIP. They were housed in a magnificent old Venetian building, which they were in the middle of renovating. It was a tasteful blend of modern corporatism and historic preservation. We worked in the Director’s office resplendent in dark oak panelling. My text had been circulated for the commercial operators’ agreement. I’d given a lot of thought to the balance between the competitive freedom of the individual enterprises and what needed to be done in common; the need for consensus where possible and the need for a vote to remove unreasonable obstruction to the common endeavour; the need for co-operation on key matters and the need to preserve competitive freedom of action. The heart of my MOU was the common resolve to get systems to the same standard into service by a common date of 1991. I reasoned that if everyone was shooting for the same target, they would be under the same stresses and therefore more likely to find common cause in agreeing upon solutions. This was to cause some friction later, with some countries that wanted to join the agreement for political reasons but did not foresee implementing systems on the same time time-scale. I stood firm on this point and it helped in advancing the investment in GSM networks in a number of countries. The impact was to be dramatic. It aggregated together the procurement power of all Europe’s mobile radio operators to kick start competitive supply of GSM systems, it combined the markets for the mobile equipment that rippled all the way back to the competitive supply of semiconductor chips and brigaded together all the national service areas into one huge European wide service area for the traveller. We went though the draft text. The only point to cause any real heart searching was whether the agreement was for signature by the cellular operators only or by governments as well. Renzo Failli said that his Ministry would insist on signing. Our view was that it should be a purely commercial agreement. For this reason the DTI would not sign. Both Armin Silberhorn and Philippe Dupuis rounded on me and said that they wanted the DTI to sign. The recent row between Vodafone and British Telecom/Cellnet was fresh in their mind. They found it difficult to comprehend that competitors could still cooperate on a self-enlightened basis. For them the DTI represented the glue for any co-operation. I backed down and we went through the text and carefully separating out the obligations. The commercial operators were to carry the commercial risks and responsibilities. The government’s role was limited to appropriate supportive actions such as technical standards. One matter that was made the subject of voting was the technical standard. The Germans pushed this very hard. They said that the dispute that they had just gone through must never happen again. It was absolutely ridiculous in a modern age that a dispute on technology was resolved at a meeting of Ministers – what did they know about technology? We put in a weighted national voting arrangement to ensure that nobody was tempted, when losing, to take the dispute off to Brussels. It signalled for the first time the willingness of the powerful European PTTs to cede their sovereignty on technical standards. It laid down the foundation for the voting arrangements for the European Telecommunications Standards Institute. Occasionally amongst all the pressures a fleeting opportunity arises to look around and see another world. Here it was Venice. I had never thought much about Venice before I got there…a product of a narrow UK technical education. With the Memorandum of Understanding agreed with surprising ease I approached the associated Technical Conference with a relaxed frame of mind. The organisers helped with some arranged tours. Venice took my breath away. How could humans conceive and build such a lovely place and on such a scale ? When I got back from Venice the next task was to sort out who would sign the Memorandum of Understanding for the UK. The choice was between the existing two operators and a third operator since there was only 10 MHz of GSM frequency channels. I rehearsed the same argument that I had put in the submission to Mr Pattie the previous year. Giving the opportunity to the existing two operators would ensure the smoothest transition to the new technical standard. The change over would be like the change over from the old black and white TV standard to the 625 line colour standard. An overlay network would be built. This would need new frequency channels if there wasn’t going to be a sharp reduction in the quality of service resulting in withdrawing channels from the old analogue service. Then new customers could buy equipment to the new digital standard without disturbing the service to existing customers. There was also the need for a healthy cash flow to allow the necessary bold investment in networks to be forthcoming. Robert Priddle and John Avery considered the matter. Both were inclined to support the existing two operators but for different reasons. Both felt that some reward was due for the extraordinary effort they had made so far. Their licences obliged them to cover 60% of the United Kingdom population by 1989. They had both achieved this two years ahead of time. The UK growth figures for the number of subscribers were looking outstanding relative to those of most of the rest of Europe. It was one of the few (if not the only area) where the introduction of network competition was delivering success. 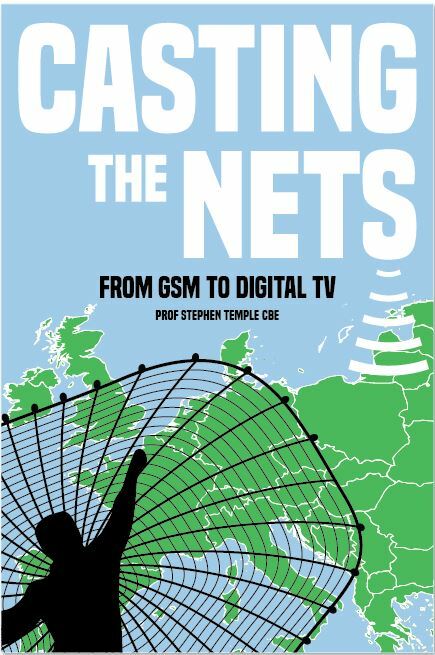 A submission went up to Ministers recommending that Cellnet and Vodafone should be the UK operators for the pan European digital cellular radio system. The note went to John Butcher copied to the Secretary of State. The Minister accepted the recommendation and a press announcement was issued next day. Just before I went on leave a note came down from the Permanent Secretary’s office (Sir Brian Hayes) to John Avery. Lord Weinstock had telephoned the Sir Brian complaining about this decision. He suggested that Ministers might have been wrongly advised. Out came all the files. To me it seemed perfectly proper advice based on impartial analysis. I went on holiday to the French Alps. John Avery was left handling the hot potato. It needed careful handling. The paper, which really settled the matter in terms of Ministerial commitment, was the letter from the former Minister Sir Geoffrey Pattie to John Carrington and Gerry Whent. When I got back from my holiday I wrote a submission to Ministers to clear the Department signing the Memorandum of Understanding. Lord Young had just arrived as Secretary of State. We lost our Minister for Information Technology. Instead Lord Young decreed that our submissions went up to the junior Minister John Butcher copied to him and Kenneth Clarke, the Chancellor of the Duchy of Lancaster. Following this procedure I put up my submission to Mr Butcher. A few days later back came his agreement. A week later I received my airline ticket to Copenhagen where the Memorandum of Understanding was to be signed. Four hours before I was due to leave for the airport a note arrived on my desk from the Secretary of States office saying that the Secretary of State did not think we should sign. I phoned the Secretary of States office and explained that it was a bit late in the day to be receiving such a note. His private secretary suggested that I fax over a supplementary note and he would try to get the Secretary of State to look at it. Thirty minutes before I was due to leave for the airport I received clearance from the Secretary of State’s Office. In the run up to the Director General’s meeting in Copenhagen I speculated how many signatures we would get on the Memorandum of Understanding. We had set the equivalent of three large countries to make the Memorandum valid. I knew the Scandinavian countries were vacillating. They didn’t need the capacity of a new system until well into the 1990’s. On the other hand they had hitherto led Europe in the development of cellular radio. The idea of the large central European countries stealing the lead with the new technology would be a blow to their pride and industrial lead. Perhaps four or perhaps eight? At Copenhagen Airport the Danish PTT had laid on a small bus to take us to our hotels. In the bus was Colin Davis the Managing Director of Cellnet, Chris Gent the Managing Director of Vodafone, Robert Priddle and myself. We talked for a while about Cellnet’s sponsorship of car racing. Chris Gent said that he thought that this form of publicity was not cost effective. Colin Davis disagreed. Certainly at this point in time many members of the public referred to cellular radio as “cellnet” at a time when Vodafone had secured market leadership in terms of numbers of connected customers. As we neared the City centre I asked Colin Davies how much freedom he had from British Telecom to buy in the best interest of Cellnet. “Complete freedom” came back the expected reply. “Would he contemplate switching all his fixed links to Mercury if they offered him a better deal?” came my tricky supplementary. “That would be a career bending decision ” shot back his witty reply. It was a relief to see that an atmosphere of normality had returned at the top between our two mobile radio operators. There was still a long road ahead to define the GSM standard in detail and this would require the experts from both companies to be working in harmony. This was to be cemented by a new DTI asset – David Hendon joined my team and led for the UK in the huge task of defining the GSM technology in detail. Unlike the USA and Japan who produce alternative digital radio technologies but only the radio interfaces bit – GSM on the other hand was to be a completely new telecommunications platform including both a new digital radio interface, mobile telephone exchange and intelligent network. The Director General’s meeting had been ostensibly called to discuss the establishment of a European Telecommunications Standards Institute. Mr Loenberg from Denmark had agreed to also include the pan European digital cellular radio item. It took much of the morning thanks to a last minute attempt by M Grenier from the French PTT to get the French language as the authorised text for the MOU. The Memorandum had been drafted in English. The French argued that French was the official language of CEPT. The Germans were incensed at this. Most European Governments can accept English Language as an informal working tool but as soon as things become elevated to a formal level then a whole new political dynamics kicks in. If the German language was to be added then the Italian Government would have little choice but to insist on Italian as well and so on. A compromise was suggested from the Chair that the French and English texts should be co-equal. This satisfied the French although it defied common sense. The Germans remained unhappy. Mr Loenberg from Denmark had a remarkable talent as Chairman in these sorts of situations. It comprised of pushing his luck to the very limit. The Germans graciously gave way. Mr Loenberg then asked who intended to sign. Everyone was truly amazed at the number of hands that went up – thirteen operators from twelve countries. Spain had still to get authorization from their Board. I went off to get the Memorandum tidied up and the sheets prepared for the Director Generals to sign. By lunch time the job was done. As I arrived in the restaurant for lunch the Portuguese delegate hurried up to me. He had just got authorization from his company to sign. Good bye lunch. It was back to the office to get the additional paper drawn up. After lunch I had the agreement laid out for signing. This was to prove to be the mobile radio equivalent of the cosmic “big bang”. It would sweep away analogue mobile radio systems across Europe into the dustbin of history, burst out of Europe and sweep around the world, knocking the mighty Japanese and US digital technologies into a poor second and third place on the way, crush telepoint and paging services and knock the stuffing out of the market for mobile satellite systems – Chris Gent was to describe it 20 years later as the most important document in the history of mobile radio.